Terahertz Technologies' O/E Converter Optical Oscilloscope Probe: TIA-4000 is comprised of a fiber coupled InGaAs APD detector combined with a variable reverse bias voltage network and fast transimpedance amplifier. 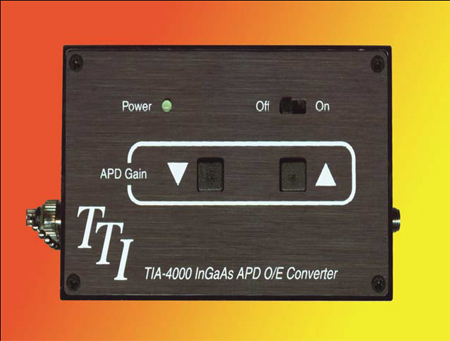 The output of the O/E Converter Optical Oscilloscope Probe: TIA-4000 is brought out to a type K female SMA connector. Light falling on the detector generates a positive-going proportional current. This current, multiplied by the transimpedance produces a voltage that is proportional to the light incident on the detector surface.